China loses sixth straight at Stankovic Cup. Click here and here for more. NBA All-Star Dwyane Wade of the Miami Heat was in Shanghai to take part in a streetball competition on August 5th night at Luwan Stadium, featuring S.K.Y Streetball Syndicate against Street China. Read more from here . 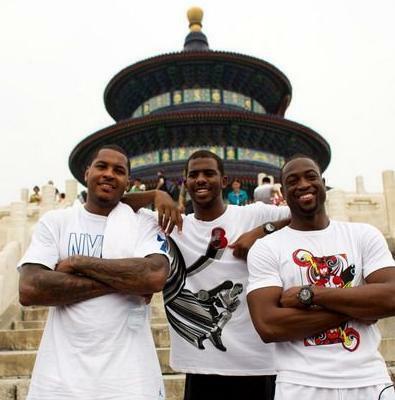 Carmelo Anthony, Chris Paul and Dwyane Wade finished Jordan Brand Flight Tour in China (click here for more); all said they’re open to playing in China if the lockout persists (click here for more). Several Chinese teams of CBA are reported to have offered millions per month to Kobe, Dirk and Wade to play in China. Read more from here . AC Milan & Inter Milan arrive at Beijing China for 2011 Italy Super Cup, AC Milan beats Inter 2-1 to win Italian Super Cup at the Bird’s Nest stadium. Read more from here . Real Madrid win 6-0 in their last match in China (Click here for more), and is to help China build academy in Guangzhou (Click here for more). Four-time Winter Olympic champion Wang Meng was expelled from the Chinese national short track speed skating team after a drunken brawl with team manager. Read more from here . China’s Olympic swimming team signs new sponsor AN0C, which stands for All Natural and Zero Calorie Beverage and Foods Company. Under the terms of the two-year deal, AN0C will be the exclusive tea drink sponsor of the team as it competes for medals at the London 2012 Games. Click here for more. RedBull China were unveiled as Official Supplier of the Yonex BWF World Badminton Championships, London 2011. Click here for more.